When it comes to boat builders there are few companies that have been at it longer than the builder of this 35’ blue water cruiser. I’m talking longevity here in the way that most Americans are not used to. Not 50, 75 or even 100 years but, Camper Nicholson has been in the business of building yachts for more than 200 years. Think of it this way: when the father of our country, George Washington, died 200 years ago on December 14, 1799, Camper Nicholson was already well on its way to being one of the most respected yacht builders in the UK. I don’t know about you, but to me that’s pretty impressive. As you can imagine, in over 200 years of boat building Camper Nicholson has built yachts of nearly every size and shape, but few of their models have enjoyed the success of the Nicholson 35. A product of Camper Nicholson’s in-house design team, the 35 was first introduced in 1971, and slightly over 200 vessels were built between 1971 and 1985. The vessel’s principal dimensions are 35’ 3" LOA, 26’ 9" LWL, and 10’ 5" Beam. The displacement is listed between 15,600 and 17,700 pounds, depending upon the source. This is a fairly substantial difference and comparing the Nicholson 35 to vessels of similar shape and dimensions, I tend to believe the actual displacement is closer to the lower end of this range. By today’s standards, this design is purely a cruising boat, although when originally designed, she would have likely been considered a cruiser/racer. The hull features a low-aspect fin keel with a large, unbalanced spade rudder mounted on a full-length skeg. This provides good tracking and quick response. The rudder is swept forward by about 7º. The 35 has a very attractive sweep to the sheer, nicely balanced overhangs and a low-profile cabin house that results in a handsome look that, although nearly 30 years old, does not seem dated or old-fashioned. The hulls of the Nicholson 35 are built of solid laminate fiberglass cloth and plastic resin. Most were built to a Lloyds Hull Molding Note that covers the specifications for the basic hull, deck, and bulkheads. This is a rigorous and conservative specification and generally ensures a strong and well-built vessel. This should not be confused with a Lloyds 100 1-A certification. Ballast is 7,300 pounds of lead. This is a healthy 47% of the 15,600-pound displacement figure. The ballast is totally encapsulated in the fiberglass keel eliminating the need for keel bolts that are vulnerable to deterioration and failure as vessels age. Nicholson 35s clearly do not have the interior volume and conveniences thought by many to be essential for a modern 35’ cruiser. Her relatively narrow beam and the designer’ s refusal to push accommodations into the extreme ends of the vessel, result in living accommodations that more closely resemble a modern 30’ cruiser. The forward cabin features port and starboard berths in a "V" configuration. This area can be converted to a large double berth by adding a filler cushion between the berths. Early models were fit with a vertical chain pipe between the berths which makes converting to a large double berth impractical. Aft of the forward cabin is a full-width head. The benefits of this installation are a larger head and dressing area with enough room to comfortably change clothes. The downside is that you must pass through the head in order to get to the forward cabin. The main saloon has a port side U-shaped dinette and a starboard settee. Some models had a pilot berth behind the settee while others utilized the space for additional storage. Further aft along the starboard side is the galley that changed little over the years. The galley is adequate and well laid out for cooking at sea. To the port side there is a navigation station that may seat the navigator facing forward or aft depending on the model. Later models were also set up with a smallish port side quarter berth. The cockpit is large, although the seats only extend aft to the steering pedestal and are not long enough to lie down on. A number of auxiliary engines were used over the years, all diesel and ranging from 25 to 37 horsepower. A marinized Volkswagen diesel was used on some models that can be somewhat difficult to find an experienced marine mechanic to service. Otherwise, all provide sufficient power and dependability when properly maintained. One unique mechanical feature of early model Nicholson 35s was the use of a hydraulic drive system rather than the standard marine gear. I personally like these systems because they allow the designer to place the engine wherever it’s convenient or the weight is desired. However, they can be somewhat more problematic to service than standard marine gears. In either case, the engine is located under the cockpit deck and access for service is not particularly good. A sail area of 550 sq. ft results in a sail area displacement ratio of 14.1, not exactly a light air rocket ship, and I like to see something closer to 16 for offshore cruisers. But, British designers have always been more conservative in this area than their American counterparts-- likely because their designs have to stand up to the gales of the English Channel and the North Sea. 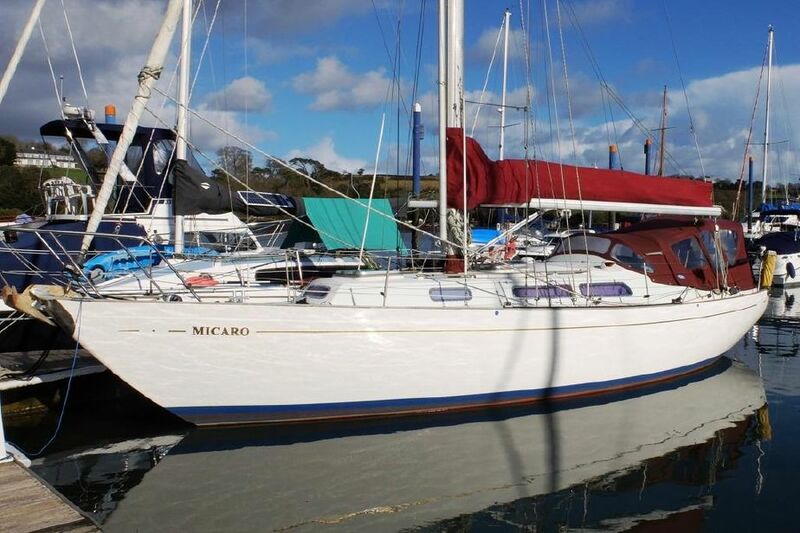 The Nicholson 35 has moderate proportions and her sailing performance matches. The 35 has an easy motion which is just what the doctor ordered for an offshore cruiser. Feranc Mate´ included the Nicholson 35 in his book, World’s Best Sailboats. This is a bit like trying to select the best baseball players of all time, and certainly some great candidates are going to be left out. However, there is no question this is a handsome, solidly constructed, conservative design capable of sailing the oceans of the world and is worth consideration by any serious blue water cruiser looking for a boat in this size range.